Retail sales last month were broadly weak, with receipts at auto dealerships falling 1.1 percent after rising 1.8 percent in May. Clothing stores sales dropped 1.5 percent, the largest decline since September 2014. Coming on the heels of June’s disappointing employment report and sharp drop in small business confidence last month, the weak retail sales data suggests the economy might have lost some momentum at the end of the second quarter, having struggled at the start of the year. 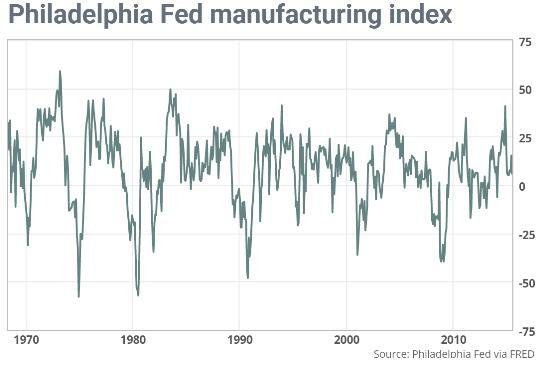 (MarketWatch) — U.S. manufacturers in the Philadelphia region are still growing, but not very fast.The Philadelphia Federal Reserve’s index of business conditions declined to 5.7 this month from 15.2 in June, marking the slowest pace in four months. Economists polled by MarketWatch had expected the index to slip to 12.5. Still, any number over zero means more companies are expanding instead of contracting. Perhaps a bit more worrisome, manufacturers also scaled back on staffing. The bank’s employment index fell into negative territory for the first time January and for only the second time in 25 months. The pace of new orders also tapered off. The index for new orders sank to 7.1 from 15.2 in the prior month. The manufacturing sector isn’t picking up any steam this month based on the Empire State index which came in only just above zero, at 3.86. The new orders index, ominously, is in negative ground at minus 3.50. This is the fourth negative reading in five months for new orders which points squarely at slowing overall activity in the months ahead.And hiring this month has slowed, to 3.19 vs June’s 8.65 in yet another soft signal. Price data show moderation for inputs at 7.45 vs 9.62. One plus in the report is a slight uptick in the 6-month outlook to 27.04 vs 25.84. None of this is really new. US manufacturing has in fact been weak for a while. But the timing and circumstances make it ominous: Six years into a recovery and with interest rates at record (and unnaturally) low levels, this kind of gradual slowdown should not be happening. Traditional economic theory says Main Street should be booming, wages should be rising strongly and inflation should be the emerging risk. That it’s not implies that the US and the rest of the world can’t grow fast enough to reverse the upward trend in debt/GDP. See China’s Debt-to-GDP Ratio Just Climbed to a Record High. It seems that we’re still violating one of the basic rules of common-sense living: When you find yourself in a hole, the first thing to do is stop digging.